ABOARD THE SULTAN SIN SULU — Here I am on a balangay, with the crew of coast guard personnel led by veteran adventurer Fred Jamili piloting us across Manila Bay. Today’s trip will be quite short but this wooden watercraft — an exact replica of the ones excavated in Butuan — is actually capable of making overseas journeys. From Maimbung, Sulu, where it was built, it has sailed to Manila via Basilan, Zamboanga, Dumaguete, and Bacolod. Next year, if all goes according to plan, this same boat will set off for China. What the “Kaya ng Pinoy” team is doing is quite extraordinary for our time, but in the past, such feats would have been commonplace. As expedition leader Art Valdez reminded me, people from Butuan and Sulu are documented to have sailed to China long before the coming of Magellan. One balangay found in Butuan was dated to 320 CE. Astoundingly, the boats were built without blueprints. And, as with other Austronesian peoples, navigation was done by an instinctive knowledge of trade winds, ocean currents, and celestial bodies. Today, however, we seem to have lost our maritime consciousness. We see this in the fact that many Filipinos don’t even know how to swim. Emergency physician Ted Esguerra, also onboard, laments that eight Filipinos drown every day and many of these deaths could have been avoided with basic swimming skills. I suspect that this disregard of our maritime culture also seeps into our everyday choices—from the sports we play to the food we eat. Unlike the Japanese who have elevated sushi to haute cuisine, many Filipinos still consider seafood inferior to meat. When I was on Babuyan Claro island, our Ibatan hosts apologized for the food they were about to serve, before showing up with huge lobsters. All these considered, our land-oriented world view — partly a legacy of the continental-minded Spaniards and Americans — has led to diminished appreciation of our country and our place in the world. Of course, our maritime culture lives on among our seafarers — known as the world’s best — as well as in coastal communities like that on Babuyan Claro, where the people have 10 different words for sea conditions, such as “abkas” for breaking waves and “lomanlana” for smooth waters, which fortunately greeted us through much of the 11-hour boat ride from Claveria via Calayan Island. It also lives on, to a certain extent, among our divers, marine biologists, surfers, dragon boat paddlers, and many others who have explored our islands and developed an intimacy with the sea. Because they have learned to appreciate our marine beauty and biodiversity, they know what is at stake in protecting them. One place to begin is right where we are: the balangay itself. “It anchors us to who we are as an island people,” says Everest climber Carina Dayondon, another crew member, as the winds propel us across the bay. 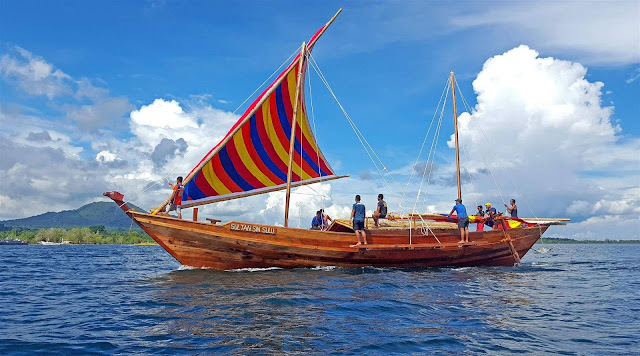 By restoring the balangay to its proper place in our history and presenting it as a living, tangible, seaworthy vessel, perhaps more Filipinos will be reminded that the waters around us are waiting to be embraced and explored. And perhaps some of us will realize, at long last, that while our archipelagic nature may have held us back as a nation, it can be also our strength — if only we can rediscover and reclaim our maritime consciousness.